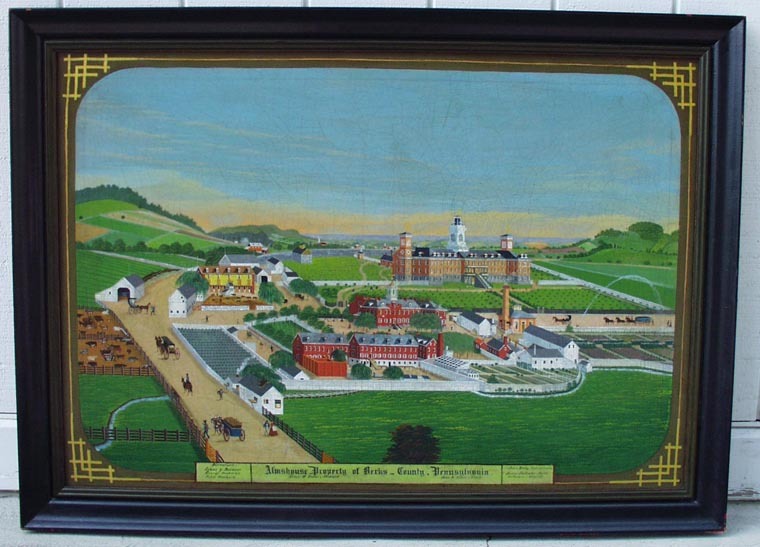 Yesterday on the Folk Art at Cooperstown site, Paul D’Ambrosio wrote about this painting that is in their collection. It is by a late 19th century painter by the name of John Rasmussen and is of the Almshouse in Berks County, Pennsylvania. This piece has really stuck with me since I saw it, not only because it is such a beautiful piece of work with wonderful color and composition. It’s more because of how it almost lovingly portrays an aspect of society at that time that is largely overlooked– the poorhouse. The poorhouses of that time were a depository for what was then considered the refuse of society– the mentally ill, the homeless, the disabled, just released prisoners and abandoned children. 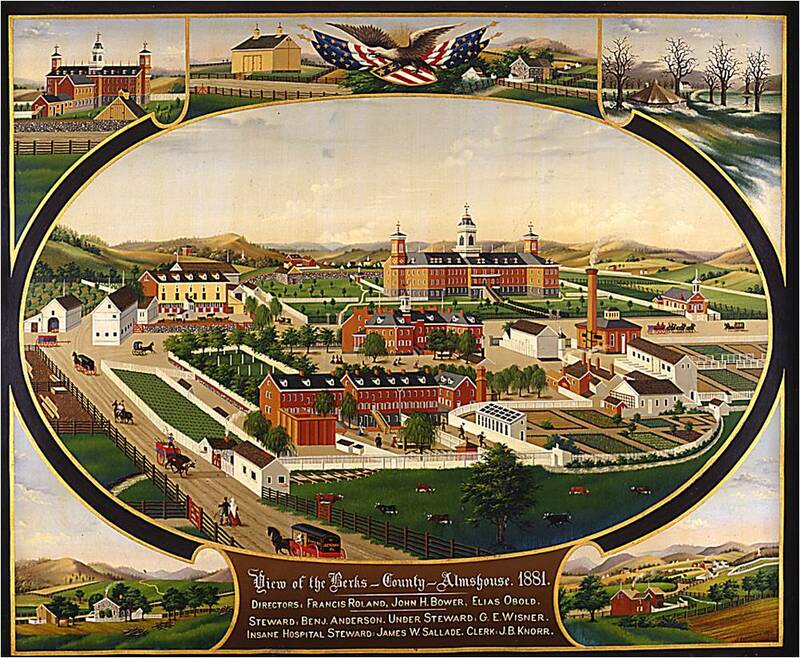 In fact, the artist of this painting, John Rasmussen, was a resident at this particular poorhouse, having had severe problems with excessive drinking throughout his life. You can imagine how terrible the conditions might have been at many of these facilities. But many, like this Berks County Almshouse had a mission of self-sufficiency and rehabilitation. It required all physically able residents to work on the farm which supplied all of the food for the resident population. They believed that the ills of many of these people were the result of not understanding the value of hard work. It actually was a fairly successful system at the time until the demands of a growing general population overwhelmed its capabilities. There came a point where it was no longer economically possible to have this type of institution in very county or town and the poorhouses faded from sight and have remained there, even in our memories of the past. I can’t say whether the system was better or worse than anything we have today or whether the residents of places such as this Almshouse would remember it fondly or with horror. But the loving way this painting is presented doesn’t give one the sense of a dark place but rather a place filled with renewed life. And I think for some, like John Rasmussen, it did represent a refuge and a palce of restoration when he periodically reached his bottom. The Berks County Almshouse is now completely gone save for a small stone wall. 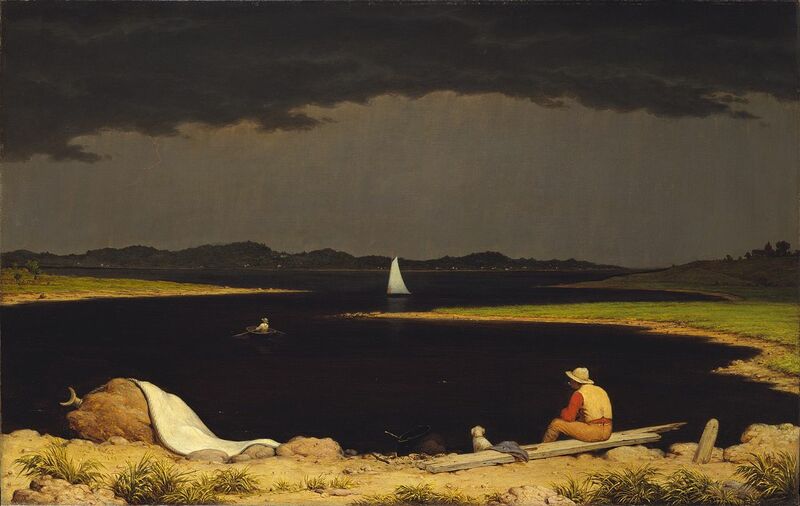 But it is preserved in the paintings of Rasmussen and others, such as this earlier painting of it by painter Charles Hoffman, also a resident at the Almshouse. And writer John Updike fashioned the subject of his first novel, The Poorhouse Fair, after this very place. I’m sure most were not like this beautiful scene but they remain part of our past and deserve to be remembered. There is another site, The Poorhouse Story, that documents the history of American poorhouses. It has a state list with pages devoted to the poorhouses of most counties. It’s an interesting glimpse into a shaded part of our past. Before I was a painter, I had jobs, as a service tech and a salesman, that quite often had me in the homes of clients. One of the first things I did when coming into a home was to look for bookshelves and scan them quickly. You could tell a lot about a person by seeing if and what they read. I was looking for something that gave me an idea of common ground we might have. It was disheartening how many homes had no books visible and many times, if they did have books, the books were mass market romances or self-help books. But sometimes there were shelves filled with great books that jumped out at me and generally I was able to establish instant rapport with that person. I became very adept at glimpsing shelves and judging what was there. 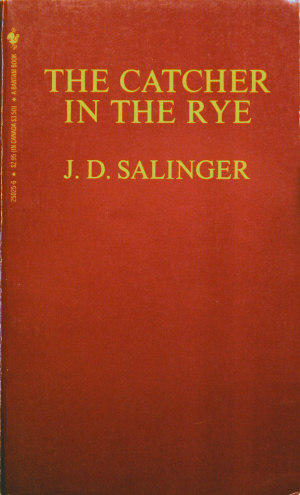 This particular edition of The Catcher in the Rye had a cover that my eye could glimpse at a hundred feet. JD Salinger died yesterday, at age 91. I don’t know that this tale of teen Holden Caulfield still resonates with the youth of today but for the generations of the 50’s, 60’s and 70’s, this book was an eye-opener, one that gave voice to the real emotions of many young adults. It was bold and funny and real. It was unlike any literature that featured a teen protagonist ( if you can call Holden a protagonist) at that time. I don’t know if Holden was just a reflection of true behavior of disaffected teens or if he became the template. That will have to fall to sociologists and cultural anthropologists to determine. Whatever the case, Holden Caulfield and JD Salinger both became cultural icons. Salinger became the very definition of recluse, eschewing all publicity and interviews with steadfast determination for all these many years, and living a quiet life in New Hampshire. While his last published piece, a short story,was in the mid 1960’s, he continued to write but only for himself, filling bookshelves with his written notebooks. I wish I could have scanned those shelves. I wonder if Holden lived on in his private writings, moving through his phony-filled life in the manner of Updike’s Rabbit Angstrom? Perhaps we will never know. If so, let it be JD Salinger’s choice to share it with us. That’s what I call this painting from a year or two back. It’s a small, simple piece. A little fanciful perhaps. For me, there is something personal in the piece. Whenever I see this piece it reminds me so much of the many jobs I had before literally falling into this career. I remember the long days spent at real labor where there seemed to be weights on the clock hands, preventing them from moving ahead. At the A&P I remember another guy and me loading a railroad boxcar with cases of mayonnaise by hand, filling it completely, one case at a time, deep into the night. I remember building chimneys with my brother in the mud and snow, hefting each chimney block up the ladder on my hip, each step a struggle as the cold permeated your core. I remember clearing the land where my home stands, cutting the white pines down and into 8-12 foot lengths and dragging them by hand to the side of the clearing. I remember starting my overnight shift as a waiter at Perkin’s Restaurant, knowing that there was nothing in store except cooks who just didn’t care and an endless supply of lousy-tipping kids, drunks and other nefarious creatures. Those nights were the definition of grind, just moving forward one step at a time. It may sound as though I’m complaining. I’m not. I so appreciate each of those work experiences, along with the many others I didn’t mention. Each had a lesson. The lesson of endurance. The lesson of realizing what you can and cannot control. Focusing on the task at hand and blocking out the rest of the world. The lesson of discovering what you were and weren’t. So when I have what I now consider a hard day in the studio, I remember all the days spent in ice and mud, my boots soaked through and my back and shoulders aching, and I laugh. Also, John Updike died yesterday. Whenever I read anything, I compare them to Updike in my head. His writing at times left me breathless, having to stop and re-read sentences and paragraphs. He was a true master and luckily for us, he left a wonderful group of work that will live on.